It seems that wherever there are technical and creative people, there is also LEGO. LEGO has been taken into space to the International Space Station and, as it turns out, there is also LEGO on the South Pole. 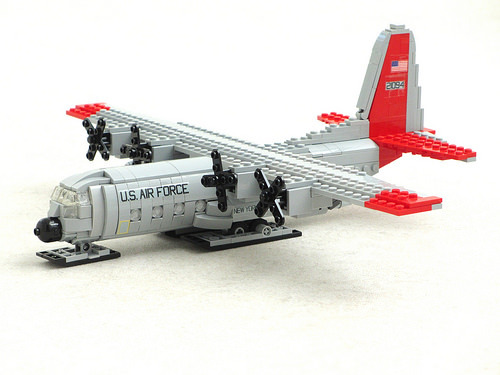 Recently I was contacted by Ethan Rudnitsky, who works at the U.S. Amundsen–Scott South Pole Station, located on the geographic South Pole in Antarctica, with a question about building a Hercules aircraft out of LEGO, with the purpose of displaying the model at the station. Ethan is part of the crew who are spending the winter there. He told me that there are other LEGO enthusiasts on the station as well and that, as part of the last supply flight in February, the crew were sent a shipment of LEGO sets. LEGO models and their builders on the South Pole. Builders, from left to right: Ethan Rudnitsky, Rachel Cook, Christian Krueger, Jennah King, Chet Waggonger and Adam Jones. Photograph courtesy of Christian Krueger. We’ve taken this opportunity to find out a bit more about life and LEGO on the South Pole, by asking Ethan a few questions via e-mail. TBB: Thanks for agreeing to be interviewed by TBB, Ethan. Can you tell us and our readers a bit about yourself? What is that you do at such a remote and cold location? Ethan Thank you for being so willing to feature us on TBB! I have been a Firefighter/EMT for 15 years but have also worked heavily as an independent contractor in the IT/Telecomms field. This has given me a lot of experience with electronics, radio systems, fiber optics, and computer systems, which led me eventually to applying to be the Communications Technician down here at the South Pole. It was always a dream of mine to come here and work, so I applied and was fortunate enough to get an offer. In the middle of winter as we are now, my responsibilities each day are simply to ensure that are local and HF (long-range) radio systems are functioning, testing our satellite phone system, fixing problems with the fiber network, troubleshooting any problems we might be having, and to address malfunctioning equipment as such issues arrive. People will bring me pieces of equipment once in a while that need component repair which I enjoy because I like to tinker. TBB: What brought you to the LEGO hobby? Ethan: For as long as I could remember I have enjoyed creating things and I have a vivid imagination. I think those are two common traits you will find among all LEGO enthusiasts. Whatever you can dream up in your mind you can create with the bricks, and you can manifest an infinite number of scenarios to act out with your creations. I have always liked that LEGO has never catered to just one group/genre. There is something for everyone no matter what you like. I was a typical boy who loved fire trucks so the much of my collection when I was young was the LEGO City series firehouses, fire engines, fire boats, etc. Someone will always find something in the LEGO brand that speaks to them and that is important. TBB: How many people are part of the winter crew and how many of you are LEGO enthusiasts? Ethan: There are 46 winterovers down here at the South Pole and I would say that there are 8-10 of us who are LEGO enthusiasts. TBB: Do you get together to build in a common area of the station or is it every man and woman for yourselves? Ethan: There was one night when a few people gathered up in our craft room to build their individual sets but in each other’s company. For the larger sets you see in the picture like the London Tower Bridge and the LoTR Tower, the IceCube project team worked on that in their office when time permitted. Other than that it is just individuals building their own sets to pass the time. TBB: Is there a common pool of parts or do you all have your own personal stash? Ethan: Everyone has their own sets and parts, but there is a bag of surplus parts that is free for anyone to rummage through if they need something. TBB: What is your favourite theme? Arctic comes to mind or is that a no go because it’s the wrong hemisphere? Ethan: Arctic isn’t blasphemy in my opinion since many of the vehicles in that series are familiar and look really neat. There are actually a number of Arctic series vehicles in different workstations around here that previous participants have left so it would seem that people are still a fan of them even though we are in the Antarctic. Personally, my favorite theme would have to be Star Wars. The attention to detail in the sets, especially the UCS sets, are amazing, and the size of the completed pieces are really great. 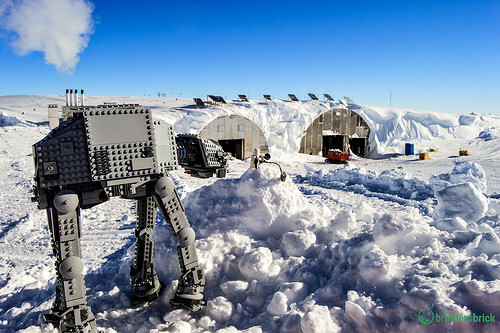 The Battle of Hoth recreated on the South Pole. Photograph courtesy of Rachel Cook. TBB: The logistics of your operations seem pretty daunting, since supplies mostly get flown in on Hercules aircraft. How do you get your LEGO and what route does it travel before it ever gets to you? Do you buy it yourselves? Ethan: Any item that is slated to come down to the South Pole, whether personal or professional, definitely takes quite the journey. There is no guarantee that anything you order will make it here so everyone is rolling the dice when they click the magical “Add to Cart” button. 99% of the people who order LEGO do so via Amazon, and I’d guess that Amazon accounts for 99% of the total purchases of other items coming down here. No matter where the order is coming from, everything ends up at the FPO (US Field Post Office) in Christchurch, NZ where the Antarctic Program has its overseas offices. From there the postal workers will separate anything destined for the South Pole and palletize the packages for loading onto military aircraft. From there it goes to McMurdo Station where it waits for a departing flight to the Pole, and finally it gets to us. Everyone does indeed buy their own LEGO. TBB: All of us at TBB and a lot of LEGO fans out there also build their own models. Do some of you do that as well? Ethan: Down here I haven’t seen any original creations but I am sure that’s just because we lack a great supply of bricks. From what I have seen from this year, and judging by the sets that have been built and left here from previous years, I think people bring/order what interests them and build it as designed. TBB: What is the coolest (no pun intended) model you’ve built recently? Ethan: My personal build that I was looking forward to was the Sandcrawler that I ordered back in the summer but unfortunately it never made it here. Because of that, I have to defer and say that the coolest build we have here (just because I enjoy Star Wars content so much) would be Adam Jones’ AT-AT. TBB: Assuming you had unlimited parts, what would you want to build? Ethan: Without a doubt I would want to build the place that we currently live; the Amundsen-Scott South Pole Station. We have all talked about trying to design it in one CAD program or another and think it lends itself perfectly to being built from LEGO because of its rectangular shape throughout. I get very excited when I think how amazing a LEGO build of the station would look and how much detail we could capture. The first few days after Ethan first emailed me, I had a smile on my face very time I thought of the South Pole. Who would have imagined that the crew there would be relaxing by building with our favourite construction toy and would be sending a message to TBB? Thank you Ethan and thanks to the other builders at the station. As a token of our appreciation, I have designed a model of the Hercules, the aircraft which services the Amundsen-Scott station, and TBB will donate to the crew of the station the parts to build a copy of it. The parts will be travelling to the South Pole once flights resume later in the year. We’ll keep you posted. 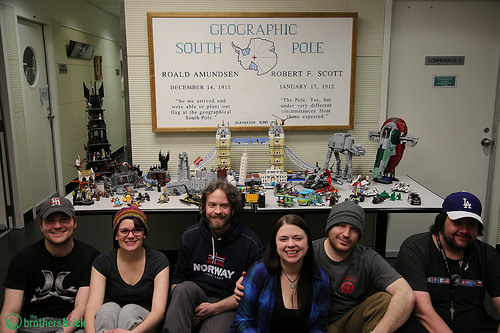 Don’t miss our follow-up article covering the LEGO Hercules model’s trip to the South Pole. It’s good to know there are LEGO builders everywhere there is man. I really enjoyed the interview and your Hercules is a fabulous model. Will you be making those instructions available to others or is it exclusively for the Antarctic crew? Perhaps selling instructions could help pay for the parts you are sending them. @GBCTom: I’m sure the LEGO fans on the South Pole will appreciate that. Very nice. @Billward Thanks Bill. I was flabbergasted to get an email from the South Pole and to find out that, not only are there LEGO builders at the base, they read TBB! I know it’s a bit self-congratulatory, but how cool is that? I will make the instructions of the Hercules available to a wider audience, probably for free. The parts are taken care of and I’d simply be happy for more people to build their own copies. However, it’s going to be after the model has reached the South Pole, which should be around Christmas. I’m sure you would, but it’s not exactly a handy format, is it? Iain joked that I should go on a field trip to deliver the model to the South Pole, but in fact it will be taken over there by a fellow physicist. He is also a LEGO fan and is due to spend a few weeks doing experiments on the South Pole around Christmas. We’ll undoubtedly report on that in more detail when it happens.